When researching the origins of this dish, two camps that have opposite points of view were found. The “traditionalists” say that combining any fish with a cheese sauce is verboten. 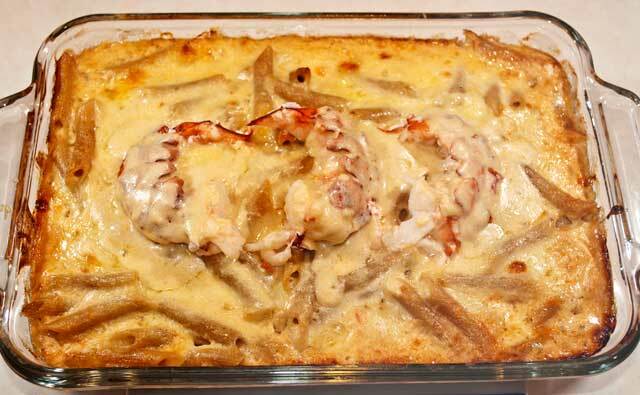 The rest of America says that they love Lobster Newburg so what is the difference. Personally, I have had some good lobster mac ‘n’ cheese and some not so good. Since the price of lobster has remained reasonable (about $5.50/lb.) in my part of the country, this seemed like a good time to try my hand at this dish. Most of the lobster mac’s are too light on the lobster for my tastes. I love lobster, and while some people might think this is a waste of a good lobster, let’s up the ante so to speak. 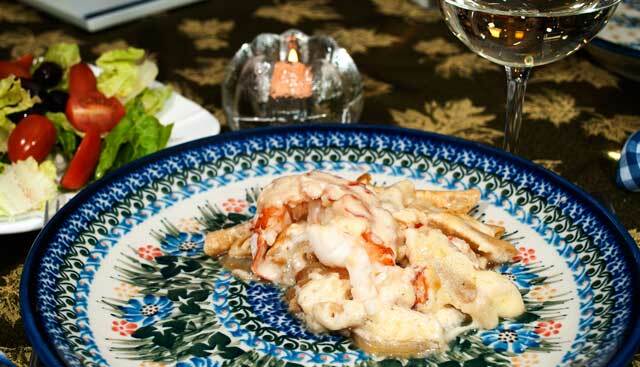 This recipe has much more lobster meat and a touch of alcohol in the cheese sauce, a cue taken from cheese fondue. 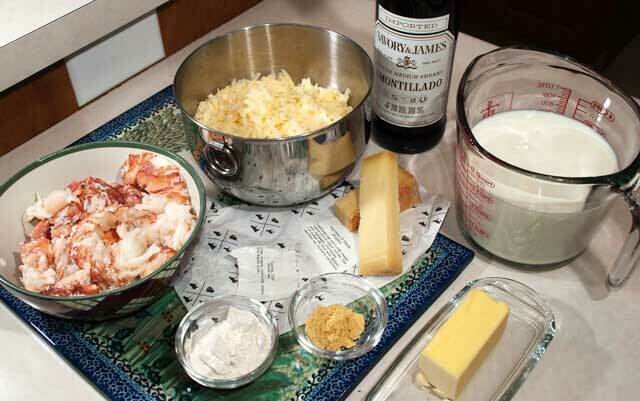 Four 1 ¼ pound lobsters were steamed in beer (my usual method). 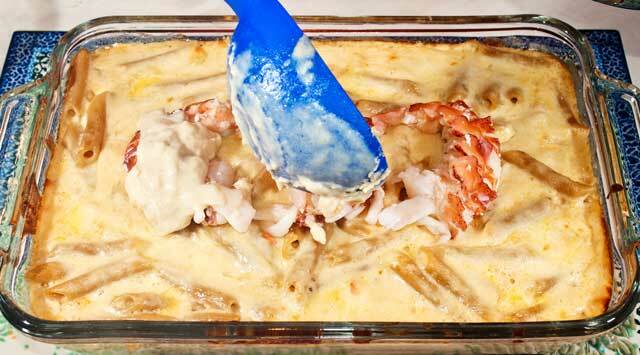 The lobsters were steamed for only 11 minutes, since the meat would continue to cook in the mac ‘n’ cheese. My loving husband removed all the lobster meat. He cut everything but the tails into large chunks. The tails were reserved for the top of the mac ‘n’ cheese. Continue by boiling 10 oz. of whole wheat penne or elbow macaroni in boiling salted water. Boil 9 minutes until the pasta is slightly undercooked. It will continue to cook in the oven. NOTE: You can use regular pasta but I prefer the health benefits of whole wheat. In a separate pan, melt 3 tablespoons of butter. Whisk in 3 tablespoons of all-purpose flour. Continue whisking for 1 minute until all lumps are removed and the flour has browned slightly. Stir in 3 cups of milk and simmer for 10 minutes. Separate the yolk from the white portion of the egg. Slightly beat the egg yolk with a fork. Add a small amount of the hot milk mixture (about 1 tablespoon) to the yolk and stir it together. This raises the temperature of the yolk, (tempering). 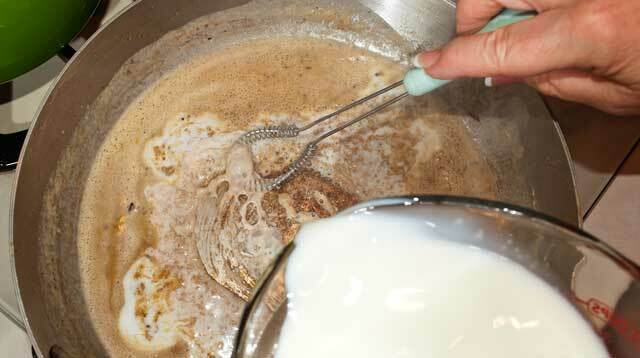 Stream the yolk mixture into the milk mixture while continually stirring. Cook for 1 minute. 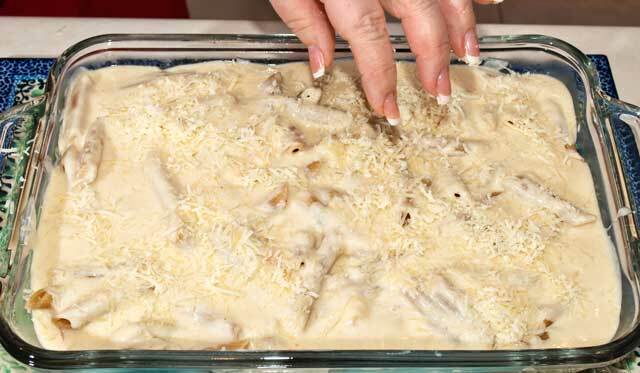 Add the grated cheeses and stir until they are melted. Add 1/2 teaspoon of freshly grated nutmeg. 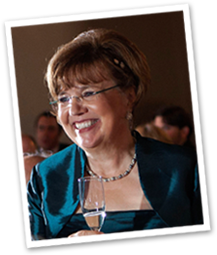 Add 1 1/2 tablespoons of dry (amontillado) sherry and stir to incorporate. Adjust with salt and pepper to taste. In a separate pan, sauté one large sliced (hard ball size) onion in butter. Sauté until the onion is golden brown about 10 minutes. Set aside. Start to layer this dish in an 8 ½ x 11 inch pan. Place half of the cooked noodles in the dish. Top with half of the cheese sauce. 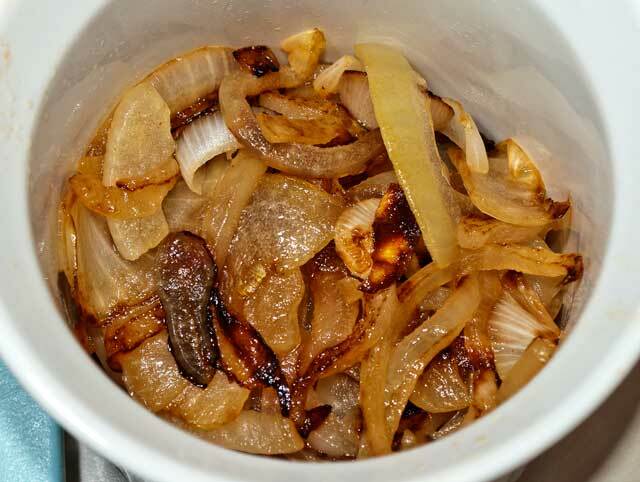 Then add all of the caramelized onions. Add all of the lobster meat that was cut into chunks. Sprinkle on 2-3 tablespoons of grated parmigiano reggiano cheese. Add the remainder of the cooked noodles. 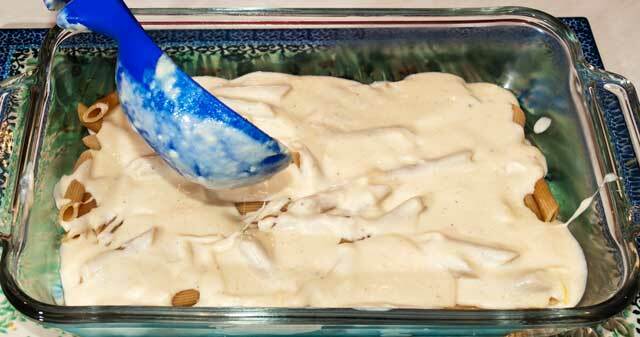 Set aside ¼ cup of the cheese sauce, placing the remaining sauce on top of the noodles. Sprinkle on 2-3 tablespoons of parmigiano reggiano cheese. Bake for 20 minutes in a 350 degree oven. Remove the pan from the oven and place the lobster tails on top of the mixture. Drizzle the ¼ cup of cheese sauce on top of the lobster tails. Return the pan to the oven and bake for an additional 10 minutes. 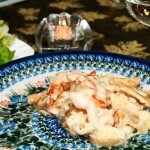 This dish yields a generous 4 servings, each person receiving one lobster tail. If you want to stretch this dish to serve six to eight people, slice each lobster tail in half before placing it on top of the pasta. Put a bottle of beer into a large lobster pot. Steam the 4 lobsters for 11 minutes. NOTE: You could also ask the fishmonger to steam them for you. Remove meat from the steamed lobsters. Reserve the tails, and cut the remainder of the meat into large chunks. Boil the macaroni for 9 minutes and set aside. Separate the yolk from the white portion of the egg. Slightly beat the egg yolk with a fork. Add a small amount of the hot milk mixture (about 1 tablespoon) to the yolk and stir it together. This raises the temperature of the yolk (tempering). Stream the yolk mixture into the milk mixture while continually stirring. Cook for 1 minute. Add the grated cheeses and stir until they are melted. Add 1/2 teaspoon of freshly grated nutmeg. Add 1 1/2 tablespoons of dry (amontillado) sherry and stir to incorporate. Adjust with salt and pepper to taste. 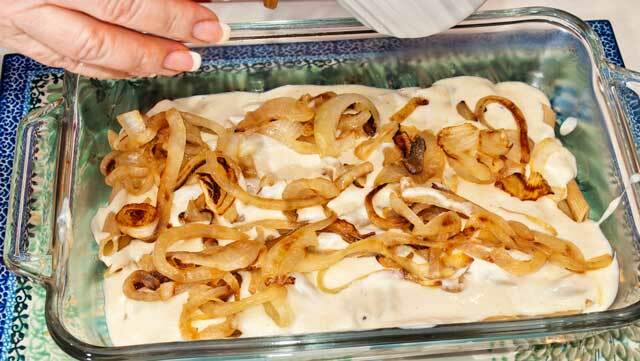 Then add a layer of all the caramelized onions. 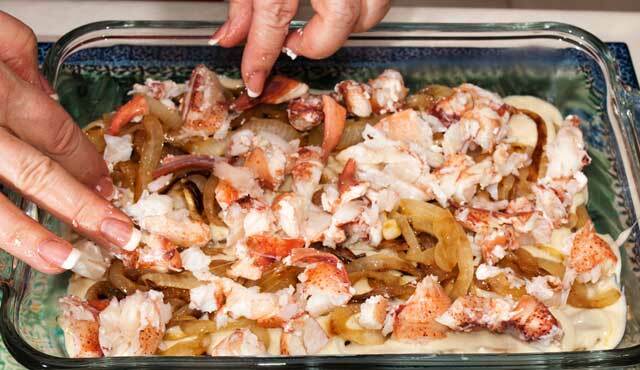 On top of the onions, add all of the lobster meat that was cut into chunks. Sprinkle on 2-3 tablespoons of grated parmigiano reggiano cheese. On top of the grated cheese, add the remainder of the cooked noodles. Set aside ¼ cup of the cheese sauce, placing the remaining sauce on top of the noodles. Sprinkle on 2-3 tablespoons of parmigiano reggiano cheese. Make extra for left-overs. 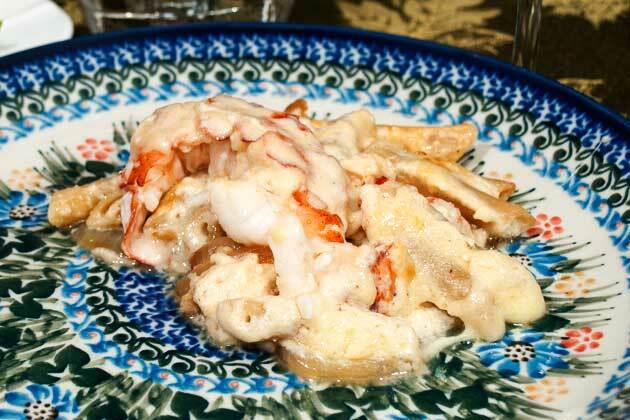 The nice lobsta (lobster if you are not from New England) taste spreads into the cheeses and macaroni. Every morsel of food tastes fantastic.